Search engines crawl the Internet to index webpages and that is the reason your site and pages are indexed without you doing anything. The problem with this is that it can take a very long time for Google and the others to find and index your new content, and some pages may even not be found at all. 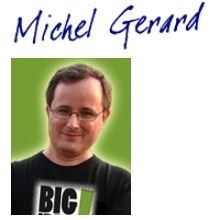 A SEO method to speed-up the indexing process is to ping each new blog post yourself. 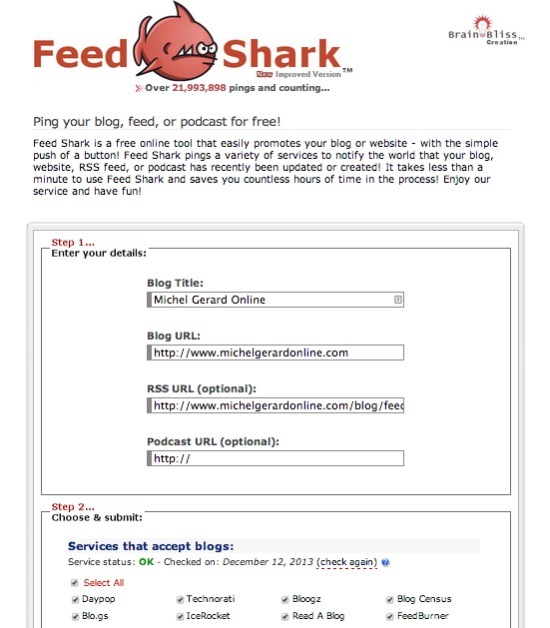 This article shows you 5 sites to ping your blog free. For each of them, you will have to enter your Blog Name or Post Title, the URL of the post, and select the different ping services. It takes only a minute to do and this will give you great results over time. Each site do not have the same list of services to ping, so you may want to try by yourself and see which one is working best for you. 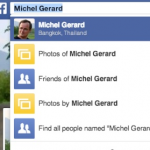 You may want to unselect the ones that are not for English speaking countries. 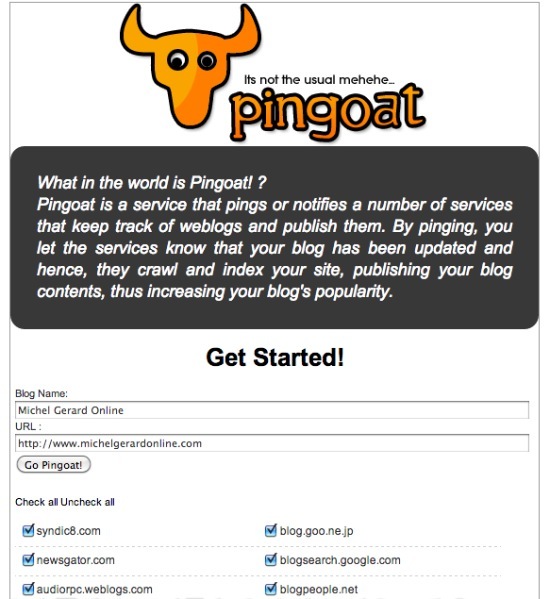 Pingoat is a service I have used a lot. As you can see in the image below it is very easy to use. 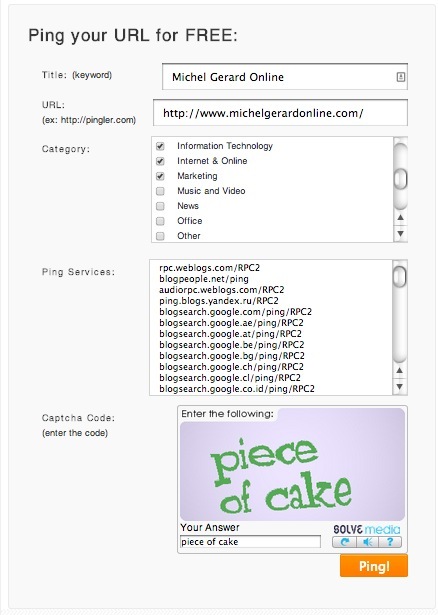 You enter your Blog Name, your URL, check all the ping services and click on “Go PinGoat”. Click the image to go to Pingoat. Pingomatic is a very well-known site that has been around for a long time. 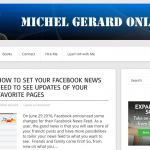 This is the service that is usually in WordPress by default to automatically ping your posts. 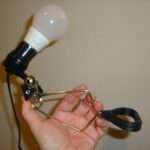 Not all blogs have the ability to automatically ping and websites don’t. You can see that there is one more option, which is to ping RSS URLs. Click the image to go to Ping O Matic. Feedshark is another great ping site. 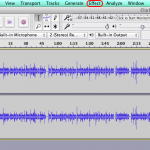 You can ping your blog or website pages and RSS feeds, but also your Podcast URLs. Click the image to go to Feed Shark. GooglePing is another option for your pinging needs and it works the same as the others. Click the image to go to Google Ping. I have just discovered Pingler and what I like about it is that it offers a free version and a paid version that has much more options. Today, we will only show what you can do for free. 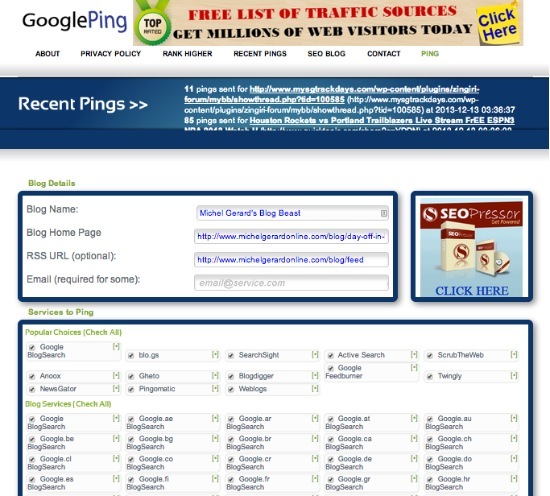 You can see in the image that there are categories you can select and that the list of ping services are in plain text. You can delete those you don’t want and you may add your favorite ones. 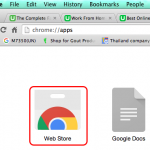 Click the image to go to Pingler. As you can see Pingler is a piece of cake! Do you ping your blog free? If you don’t, well… you should. Choose one of these site and start to ping your blog free.